Do you enjoy helping others reach their goals financially? Do you like building relationships with families, individuals, and business owners? If so, — and if you haven’t already learned — a career as a financial advisor may be perfect for you! The financial industry is growing and constantly changing. 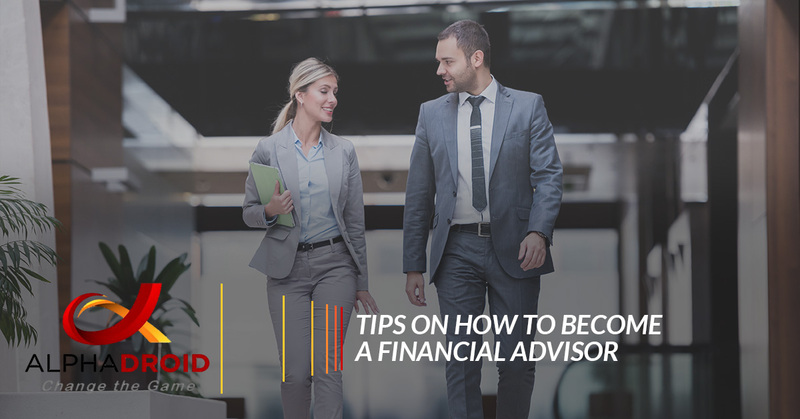 If you’re interested in, and passionate about, becoming a financial advisor, check out these tips for developing a future as a financial advisor or planner. The financial industry has changed throughout history. And, when you’re deciding whether being a financial advisor is a career you want to pursue, the first step is to understand the current trends in the industry and what being a financial advisor involves. Gone are the days where financial advising only consisted of cold calling prospects and selling insurance. The industry has shifted from commission based advisors to fee-only advisors, meaning they only get paid for the services they provide. Advisors help their clients live a rewarding life as they help others figure out their goals, using their finances to support said goals. Many advisors cherish their rewarding and flexible careers. To become a financial advisor, a minimum of a bachelor’s degree is expected. Although it is not required, having coursework in accounting, finance, and even economics can be helpful in pursuing a career as an advisor. Advisors and planners also need to obtain strong verbal and sales skills, as well as problem-solving and quantitative skills. In the end, an advisor’s compensation is based off their performance and numbers, not their education. To become an advisor, it is required to pass an exam and meet continuing education requirements. A CPF certification is a top-of-the-line standard in the financial industry and is something that catches a firm’s eye. Networking is a powerful growth strategy in the financial industry. It also is a key contributor to your chances of success. Networking with other advisors and joining groups can help you make connections within firms. Consider getting involved with events and networks within your community. In addition, try reaching out to current advisor to mentor you, and webinars and conferences throughout the industry. Going back a few decades, networking consisted of connecting through direct mail or in person. However, technology has given advisors and planners a tool to effectively market themselves in a variety of ways: social media. As an advisor, you should be viewing yourself as a brand. You can utilize social media to share articles that relate to financial planning, investing, and any other topics that you would be interested in. The branding you create will influence how prospective clients view you, and it will also give them a chance to get a feel for who you are. Finding clients can be one of the biggest challenges for some financial planners. Networking is a great way to find clients. While there are many ways to find clients, an easy way to start building your client base is to do as many informal interviews as possible, whether they are in person, written, or video interviews. Conducting these will help open doors to future mentorships and job opportunities. In addition, establishing three target audiences you have connections with, and ask their preferred method of contact. If you plan to target a younger crowd, you should not only use social media to connect with them, but also utilize a blog, a newsletter, and other forms of digital communications. If you plan to target a middle-age market, their preferred communication methods may be different. Advisors have to be able to connect with their ideal client on their level, talking in a language they can relate to. Communication is vital in the role of advisor, and clients are looking for those who are concise and effective in both written and verbal communication. Being a good communicator will make your clients more likely to implement the plans you recommend to help them reach their goals. It’s uncommon to have a financial advisor pursue a career without having the motive of one day launching their own firm.And, if you plan to work with a younger target market, launching your own firm may be the best decision. If you ask advisors that owns a firm what their biggest regret is, you may find that they regret not launching their own firm sooner. It is also beneficial to know that when you become an advisor, you won’t immediately start seeing the amount of money you had hoped for. The career path for financial planners and advisors is a marathon, not a sprint. It takes time to build a clientele and start seeing success! The career path to becoming a financial advisor is no walk in the park. Trying to balance the work and client interaction can be difficult. At AlphaDroid Strategies, we are proud to help financial advisors and planners everywhere by offering them effective technology for their work. We know how the financial market changes and how important your clients and their investments are. Because of this, we offer planners and advisors premium algorithmic trading strategies and software. Our asset allocation software was created to do the hard work related to financial planning, allowing advisors to focus on their clients. Our software will allow you to direct your attention to your clients needs and focus on reaching your personal goals, whether its a specific sales amount or launching your own firm. To learn more about AlphaDroid Strategies and our effective asset allocation software, click here!